Short-term investors saw this and decided that it’s a bad thing – as engagement goes down, so will revenue. And FB stock took a hit. But if we take the long view, we can see how this strategy is like to pay off. I wrote a small Facebook application that scans your friends list and finds how they are related to each other. It prepares the data in a format compatible with Many Eyes. You can visualize this data in Many Eyes to see the connections between your friends. About the visualization: The people on the left are my high school friends, the dense nodes on the right are my current grad school friends and people on the fringes are college friends and other common friends. Please head over to http://apps.facebook.com/manyeyes/ and visualize your data. I would love to see what other’s people’s data looks like! This also opens up another interesting dilemma: I accessed information about my friends since I am their friend and they know that I can access it. But I am sure they do not expect me to make a text dump of it and visualize it on a publicly viewable website. I have been thinking hard about my right to do so or their incorrect expectation in this regard. I trust my friends with my information. But if they are not trustworthy, the only thing I can do about that is remove them from my list – this the advice Facebook itself gives to get rid of stalkers and bad wall-posters. I am very interested in hearing from my friends (it’s your data in this visualization) about what they think about this. Disclaimer: This post makes a reference to the death of a young girl in Mumbai. I never knew her but I wish that her soul rests in peace and I really hope her murderer is found and duly punished. However, this post is about the interesting phenomenon of ‘social investigation’ I have observed around this ‘incident’ (if I may call it so). A 24-year-old Tata Consultancy Services engineer was found dead on Monday morning in a hotel room in Andheri, where she had checked in with a male companion on Saturday. Koushambi Layek, a systems consultant with TCS, was found dead in room number 202 of Hotel Sun-n-Sheel in Andheri (East) when the hotel staff opened the door with a duplicate key after their repeated calls on the intercom went unanswered. She was found lying on the bed soaked in blood with two bullets wounds. 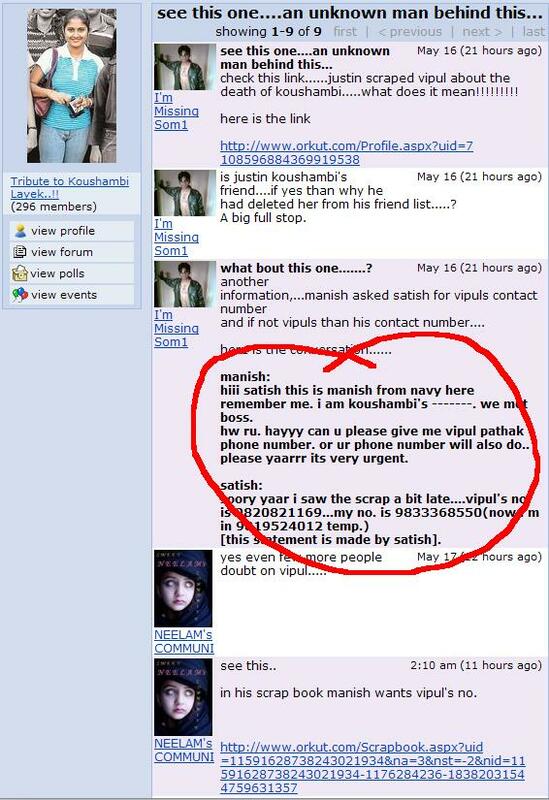 She belonged to a cohort which is very active on Orkut and this incident is being heavily discussed online. Her scrapbook is being filled with messages of peace and condolences and rage for the murderer. Communities have been created to discuss this incident and make sure the message and investigation stays alive until justice is done. The above post shows how they found the accused individual frantically requesting phone number of another individual which has raised doubts about the potential involvement of someone else. The police too has been actively monitoring these communities to find interesting or implicating evidence. Can this information be used as hard-evidence? Does this incident highlight how social investigation can possibly help law enforcement in the future? It surely highlights the importance of scanning social networking sites in addition to emails and web-access records to gather evidence. Is it harmful for investigation proceedings and speculations to be publicly available like this? As our lives become more public through these social networking websites, we probably want to reflect on what information about us people may get at in the future and whether we are comfortable having our information available in ways we do not foresee today.